How To Make The Best of Terminology Management? Most companies use a great number of industry-specific words. All of them need to be accurately stored, shared and translated. Project managers choose a range from anything to everything, from a product name to a marketing tagline and they will also often have their preferences for terminology used in translation projects. The simplest example: one company may prefer the term ‘car’ to be called ‘vehicle’ in their technical documentation, because YES. And it makes perfect sense! That’s why Terminology Management is one of our favourite tools – it provides coherence and flexibility during project completion, both at the same time. If you want to know why is terminology management important, what are its biggest benefits and how to make it even more of a translation project saver, just keep on reading. Why Is Terminology Management Essential To Keep Your Content Consistent? Have you ever stared blankly at a specialized medical or technical text in your native language? These two fields have practically their own vocabulary, so even if you read a medical text in the language you fluently speak, it can make your head spin anyway. It’s a fact: medical and technical texts are very dense with specific terms and specialized vocabulary that non-specialists don’t see that often. It can be the same with technologically-savvy content or a company vocabulary. Now, the best part – add translation to the process! Think about all of the terms that are barely understandable for you, and imagine a translator trying to connect the dots. The truth is that to translate a medically or technologically specific content you don’t have to only speak the target language, but also understand the “language” of medicine or given technological branch. The example can go even more ‘down to earth’ – a marketing strategy with specific taglines can be equally tricky for a translator. Keeping the track of all of the specific terms during translation process is not only tricky but nearly impossible, especially when not one, but more translators are working on a given project and especially when the project is lengthy. A simple Terminology consists of words, phrases and technical terms used to create sentences in a translation solution. This may be described as the most basic form of Terminology – a glossary. Most lists of terminology interface contain two columns: the first one contains terms in the source language and the second one goes with corresponding terms in the target language. To most of the people (both tech-savvy and not), a standard terminology list would look simply like a dictionary. At first glance, Terminology may seem super easy. Hey, I’ll just write the source text column and the target text column with specific references and we have it covered, yeah? However, the truth is a bit more complicated. Terminology management is not a tool itself, but a process of creating and documenting vocabulary in orderly and systemized fashion. The tricky part is that the process should occur before the translation takes place because specific terms really make the meaning of a specialized text. When they are properly documented before, a translator has more time to get familiar with what they mean and how does the whole text feel. Creating proper Terminology will also save time that the translator would otherwise need to make a decision about the meaning of a given term – with Terminology they already get it. Another thing is maybe less tricky, but more time-consuming: all the steps you need to do to plan Terminology Management. As a fact, it may remind you of a more complex decision-making process. To create the simplest glossary, one must read through all of the text and decide which specific terms are essential for localization and hence, for a documentation in a glossary. How to decide which ones are going to be found on the list? Is it the frequency? If the word appears densely in the text, it certainly deserves being put in a glossary. But what about the term’s specialization? The more specialized the term, the biggest need there is to put it on that fancy list. After creating the list, it needs to be translated into the target language and here the fun begins again. 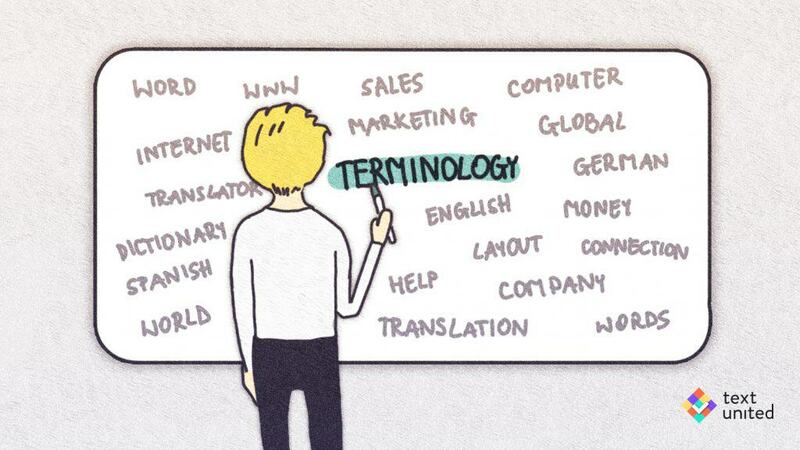 Terminology Management Tools vary from the already mentioned twice, simplest glossary to a complex concept and diagrams creation to convey the meaning relation between terms. All of them do the job but as Terminology makes it both for translators and clients who can maintain the consistency, we’d suggest using something extra. At Text United, we added a feature of a Company Dictionary to our Terminology Management about a year ago. It’s a very simple tool, but it makes it extremely easy to have the best of advanced terminology management. Text United has now three types of accounts within a company: Administrator, Power User and Users. Regular users are not allowed to make changes in the terminology. They can only enter, search and preview the terms in the Company Dictionary. Power users and administrators have no restrictions in the Company Dictionary. They are able to add new terms, accept or reject translations and add details to individual terms such as pictures and description. The domain of a term is now shown in the company dictionary. It’s also available to preview for each term in the translation editor. The default button will mark a term as the default translation. Alongside, you can see multiple translations of one term – translators will be able to recognize the default term which they are supposed to use in the translation project. Your terminology repository will contain all terms merged from projects’ glossaries (after project’s completion) and the ones you added manually or imported. These terms are automatically added to your projects glossary and will be displayed as proposals on the right side in the translation editor. If a term contains additional details, you and your translators will be able to preview this information to better understand the term and the context in which it will be used. 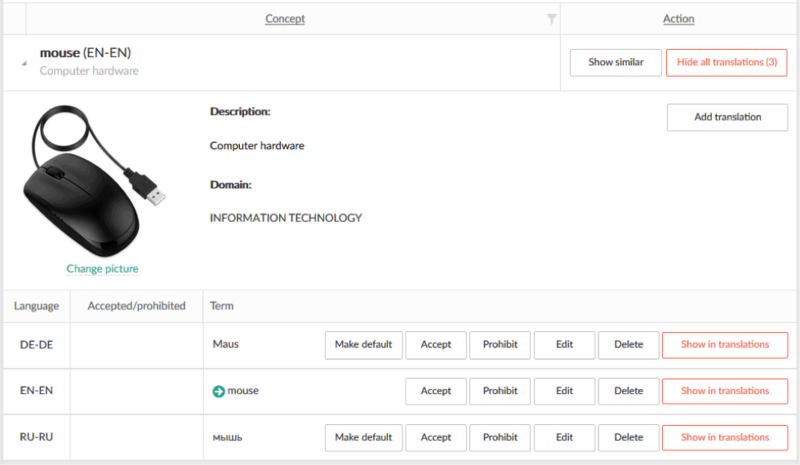 Since Terminology management is an advanced tool, it was until recently only accessible in the Text United desktop app. Now it’s accessible now in the web app as well! It’s time to get consistent!